I was born in Moorhead, MN and grew up in Fargo, ND. I was drawn to study dentistry from an early age, based on the care dentists provide for families as they grow for several generations. I graduated from NDSU in 2001 with a degree in Zoology and then graduated with a Doctorate of Dental Surgery from the University of Nebraska College of Dentistry in 2005. I was happy to move back to my hometown and now own the same dental practice I went to as a child, Dr. Lee Simmons. 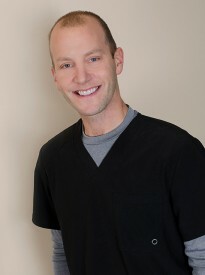 I enjoy providing comprehensive dental care for patients of all ages. I have a strong belief in preventive dentistry and conservative dental treatment. I am a father of four children and enjoy spending time with my family, music, movies, and sports. One of my favorite hobbies is running. My wife and I enjoy traveling to run marathons and hope to do the same with my children as they grow.